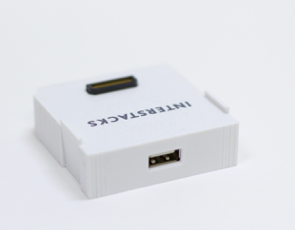 The Interstacks Barcode hardware block lets you connect a USB Barcode scanner to your stack. There are many vendors that sell Barcode scanners (not included with this block) with a USB host connector (e.g. Sparkfun). Simply plug the Barcode scanner into the USB Host connector on the back of the Interstacks Barcode hardware block. When a barcode is scanned, its value will be output as a character string from the Barcode block, “Barcode”, output terminal. Use Stackbuilder to connect this output to the rest of your stack blueprint. “Barcode” – out (String) – Sends string with scanned barcode. Assumes using HID keyboard USB barcode scanner that ends scan with newline character.